Hi, and welcome to the blog tour to celebrate the release of Adulting 101 by Lisa Henry. 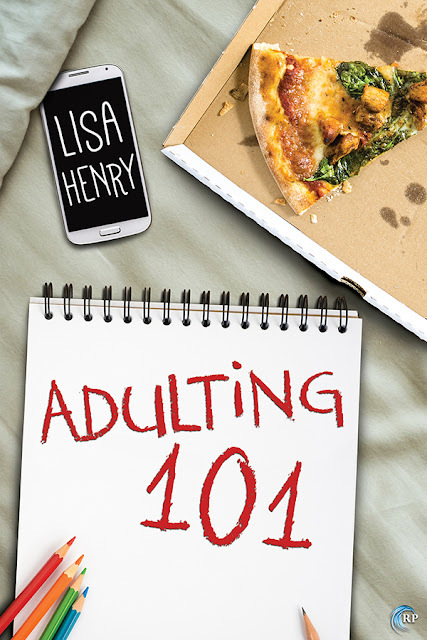 I’m visiting some of my favourite blogs around the place to talk about writing Adulting 101, some of my influences and inspiration, and even sharing an excerpt or two! Don’t forget to leave a comment for your chance to win a prize! You can find out more about Adulting 101 at Riptide. Lisa lives in tropical North Queensland, Australia. She doesn't know why, because she hates the heat, but she suspects she's too lazy to move. She spends half her time slaving away as a government minion, and the other half plotting her escape. Each comment on this blog tour enters you for a chance to win a $20 Riptide credit and an ebook of your choice from my back catalogue. You’ll also win a super secret cute little gift that’s very close to my (and Nick’s) heart! Entries close August 20, and contest is not restricted to US residents. Remember to leave your email address in the comments so I can contact you if you win!